Posted on October 31, 2011 by Brendan Jones Posted in teacherstuff	. In the job I’m currently working in, I’ve had plenty of information coming over my desk and through my screen on what modern education looks like, sounds like, feels like, smells like. Edu thinkers are not only calling for change, but many are stepping up and going about bringing that change into reality. My thoughts naturally move to what all this has to do with PE and what it will look like from now on as well. There is certainly a move away from traditional “schooling” and practices in education, and PE is certainly not immune from this train of through. In fact I think in many respects the teaching of PE needs a shake, like a dusty old blanket. The days of the blackboard teacher are rapidly ending, with the reliance of “sage on the stage”, face the front, desks in rows, “repeat after me” teaching consigned to a necessary redundancy. Traditional PE practice of “give me some laps”, chuck them a ball, captains picking teams and ” BMI as assessment” (to name a few) need to go the same way. The shift to “modern teaching” can be fraught with frustrations for many leaders, with school politics, staff resistance and a lack of change leverage opportunities stopping many transformational journeys before they start. Even the word “teaching” has a redundancy around it – but I’ll come back to this later. So what do modern students and their teachers need in C21? There is an absolute plethora of views on what today’s students need to “get” from school. There are common themes. The implications for teachers and what they do it class is changing too. Most agree that teaching “knowledge for today” is not good enough – our teaching needs to be for the future. Information ages rapidly. Students need skills that take that into account. Students need to become lifelong learners – the idea that knowledge and skills acquired at school are just to get you through this year’s exams is redundant. Learning needs to become a flexible and resilient habit of mind – in both students and teachers. ICT shouldn’t be integrated into learning environments – it should be ubiquitous. Mobile devices are carried by our students almost continually outside the school fences, but are mostly banned in classrooms. There is a definite disconnect there. Professional learning for teachers needs to be individual and situational. And available 24/7. Personal learning networks are no longer optional. Utilisation of learning taxonomies like Biggs SOLO work, where adding complexity to a learning pathway adds rigour and meaning to learning experiences. Specifically to PE, there are some great things happening in shifting what we do into the future. Jarred Robinson , Jay Trevaskis, Dr Ash Casey and Vicki Goodyear, Ben Jones, Joey Feith and Clarinda Brown (to name but a few using the #pegeek tag on Twitter) are exploring and sharing their journeys in making PE meet the future. This brings me back to terminology – the word “teacher” suggests one way movement of information. To accomplish many of the things that I’ve just mentioned, a change in job description is needed, one that PE teachers will relate to. 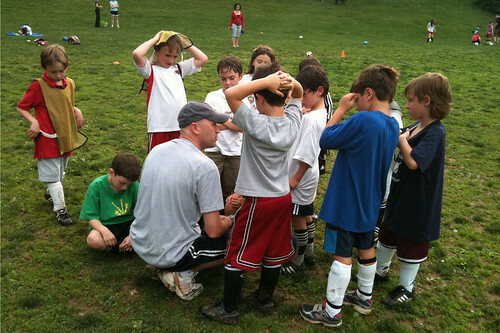 The word “coach” is closer to what we should do. It suggests someone working with people aiming for a goal, and our job is to maximise that potential through tailoring a program that meets their needs for the future. In saying that, I do acknowledge that the word “coach” has suffered at the hands of people that don’t coach well, and it carries a stereotypical image that we might be best advised to avoid. Who has a better name? So what are the implications for PE in the future? I don’t think it’s enough to rest on the bandwagon of “obesity action”. This certainly gives the work done in PE faculties a high profile, but there are some tensions here too. Fighting a society wide problem always seems to be PE’s lot. Competing with much louder and seductive voices can be difficult. It can be daunting to plan for and can easily appear to be on the verge of failure. That’s not to say we don’t try, but our approaches need to be quality. And what is quality teaching in tacking obesity, or any other societal health crisis? Ill-conceived programming can be very counter-productive. I see PE’s greatest sphere of influence in the skills that researchers are advocating as essential. Coincidentally, they are traditionally core business for PE. From the quote I used before, skills like critical thinking, problem solving, communication and collaboration are what students will need to be coached in. You don’t have to think too much about how PE teachers do this work day in and day out already. In Australia, we are about to see the birth of a National Curriculum in Health & Physical Education. From what I’ve seen and heard already, it’s draft form caters for many of the things already mentioned in this post , so kudos to the designers for that. PE advocates in Australia will have the opportunity to help shape the final product. Now is the time to build a curriculum that grows into the future for the benefit of both the students and ourselves. Tags: 21st Century, 21stC, Change, curriculum, PDHPE, PE	.